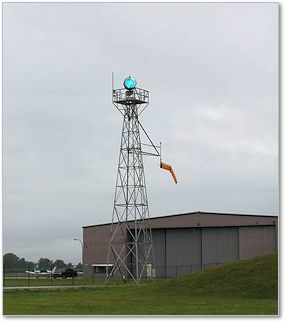 "Sometimes at my home airport, the airport beacon is on during the day when the weather is bad. At other airports, it is not. Why is that?" - Andrew E.
"In Class B, Class C, Class D and Class E surface areas, operation of the airport beacon during the hours of daylight often indicates that the ground visibility is less than 3 miles and/or the ceiling is less than 1,000 feet. [In this case] A specific ATC clearance is required for landing, takeoff and flight in the traffic pattern. This is known as a Special VFR clearance. You should not rely solely on the operation of the airport beacon to indicate if weather conditions are IFR or VFR. It is always the pilot's responsibility to comply with the correct flight rules for the existing weather conditions. At some locations with operating control towers, ATC personnel can turn the beacon on or off when the controls are located in the tower. At some other airports the airport beacon is turned on by a photoelectric cell or time clock and ATC personnel cannot control them. There is no regulatory requirement for the daylight operation of airport beacons."